At first blush, Annell Livingston’s tightly gridded abstractions might appear to be successors to the Op Art frenzy of the 1960s, but on closer scrutiny her gently rippling canvases are not so much interested in playing visual tricks as in conveying the passage of light and a feeling of transience. 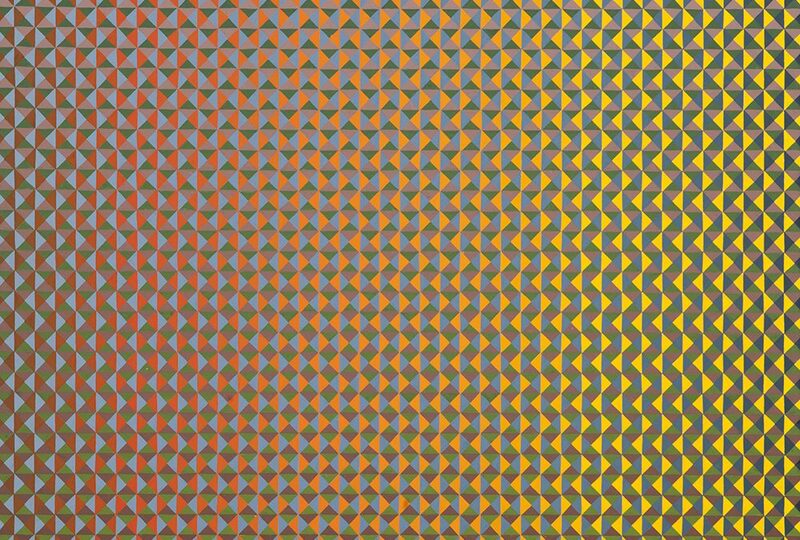 They may recall, for instance, the journey of late-afternoon sun across a wall or floor; their poetry finds its antecedents in Agnes Martin, not in Bridget Riley. Married at 21, she describes herself as one of the “oldest taken-care-of women in my neighborhood,” But she painted every day and also took classes with Lowell Collins, the former director of the Glassell School at the Museum of Fine Arts in Houston. She also returned to the University of Houston to study ceramics, printmaking, and experimental painting. In 1993 Livingston’s husband drowned in a freak accident. The blow was devastating. “My husband had been my boyfriend since I was fourteen years old,” she says. Not long thereafter, a landmark Agnes Martin retrospective, which originated at the Whitney in New York, arrived at the Contemporary Arts Museum in Houston. 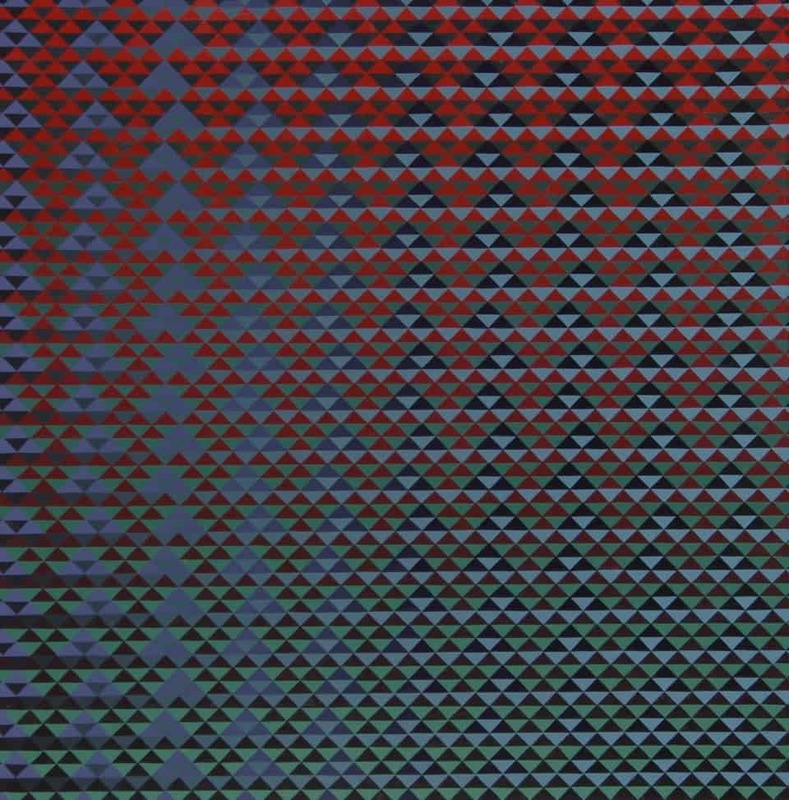 “Her work was very comforting to me,” says the artist, and the encounter with the doyenne of Minimalist painting seems to have reinforced her own inclination toward structuring with the grid. About a decade ago, a dealer in Santa Fe asked Livingston if she would be willing to try her hand at still life. “It took me a while to get to the point where I could paint these,” she recalls, “but when I did, I wanted to make something that everyone else wasn’t doing.” She looked for motifs and subjects native to northern New Mexico, collecting Mexican pottery and using local flowers and vegetables. The results were pleasing and marketable, but not ultimately where the artist wanted to go. 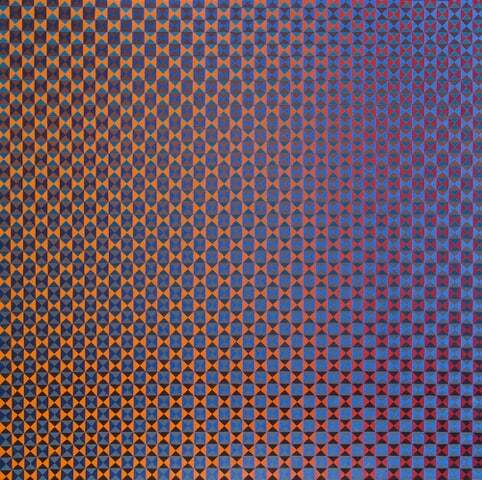 Gradually she began abstracting from the still-life images, pulling apart the compositions, re-introducing the grid, and arriving at a kind of abstraction where the original image has almost completely disappeared and small geometric units remain supreme, producing an illusion of subtle gradations and nuanced change across the surface. “it seems I work in a series until I have exhausted it, or myself, or put it away and then after a time I return to it, and it’s new for me again,” she says. Of her tendency toward reducing images to their most basic components, she says, “The simpler something is, the more the doors open to creativity. You think, ‘I’m sure I’ll get tired of this pretty soon,’ and then you see new possibilities.” Like many an artist before her—one thinks of Mondrian or Josef Albers—Livingston has discovered that, almost paradoxically, limiting the parameters can expand your horizons. 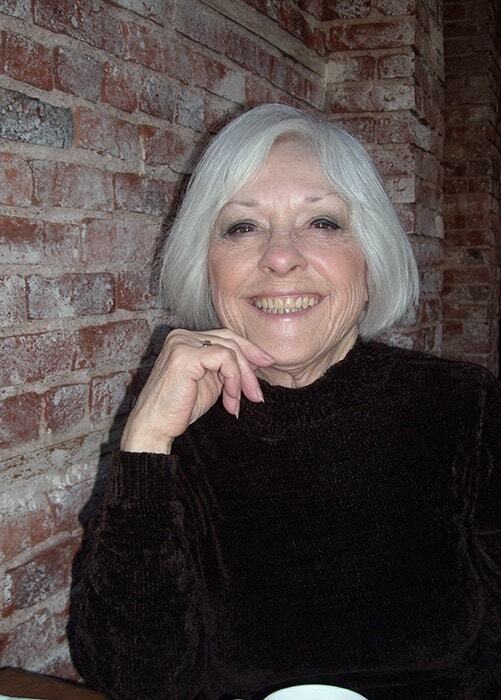 Annell Livingston has had many solo shows throughout the Southwest and in Palm Desert, CA, and Gunma, Japan. She has recently participated in juried group shows in New York, California, Texas, and Maryland. Annell Livingston’s hard-edged horizontal, vertical, and diagonal gridded paintings are filled with a multitude of hand painted gouache shapes. This, in and of itself, is remarkable in a time when computers and super printers can manufacture diagrams and color patterns with clicks of a mouse. But she paints each form, and much like the difference between an engraved print and photo reproduction, they carry a distinct visual presence that differentiates them from mechanically reproduced processes. 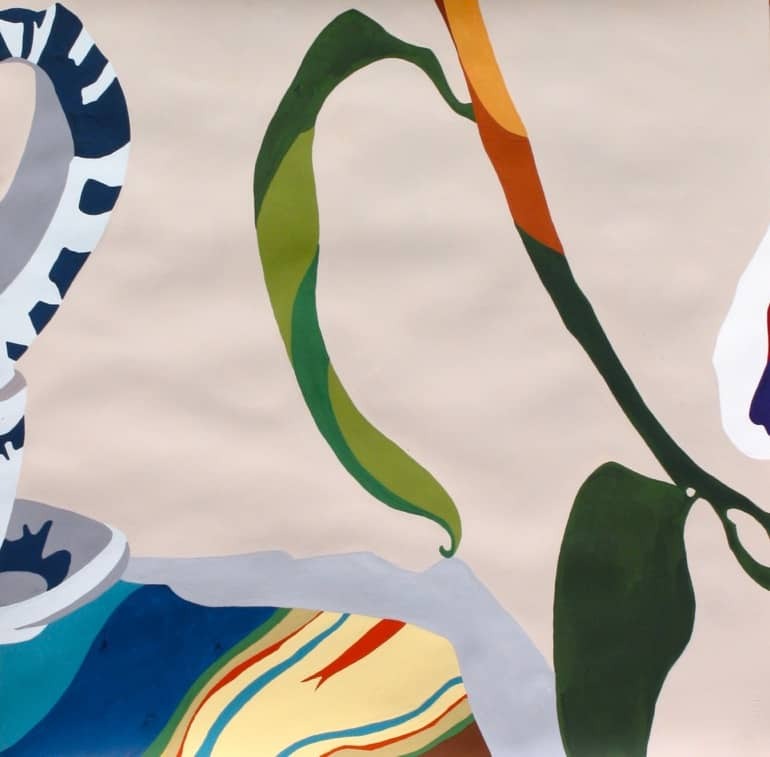 The variance of the matt gouache sitting on the surface of the paper, subtly recalls the artist’s hand and the passion and perseverance required to create the images. For each painting, the color in a particular set of like-forms may remain identical; in others, a gradual change of hue, value, and intensity create visual movement across the composition. Color simultaneity creates optical illusions that seem to distort hues although they have not been physically altered. The effect recalls Op Art from the 1960s, which brought dynamism to seeing art. One was not simply interpreting what one saw, but was forced to engage the work in an immediate and perceptual manner in an attempt to understand the illusions of depth and movement. 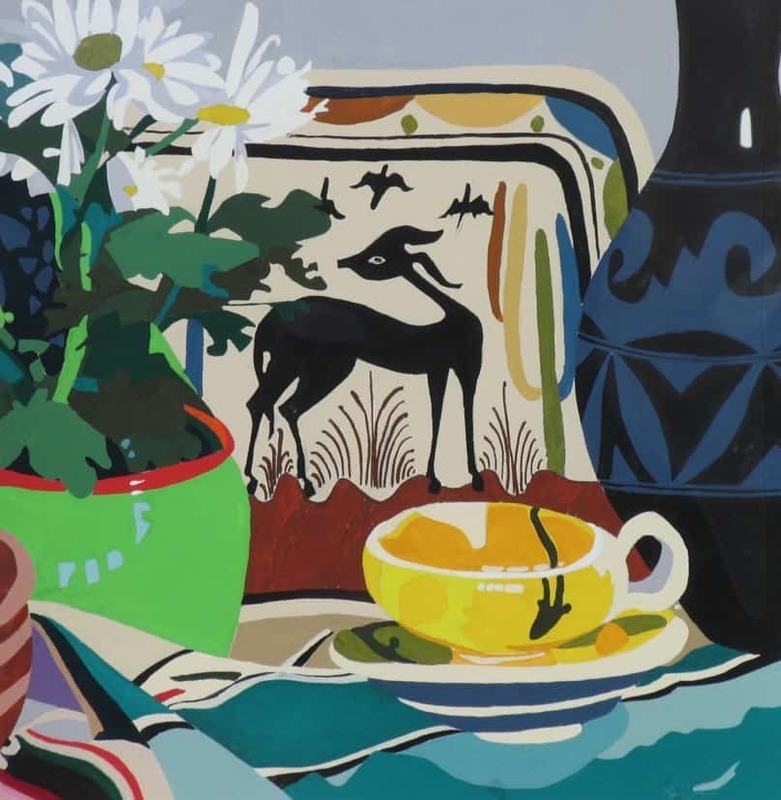 Large high-contrast circular forms in many of Bridgette Riley’s works, for instance, leave the viewer with a sensation of falling into the composition. 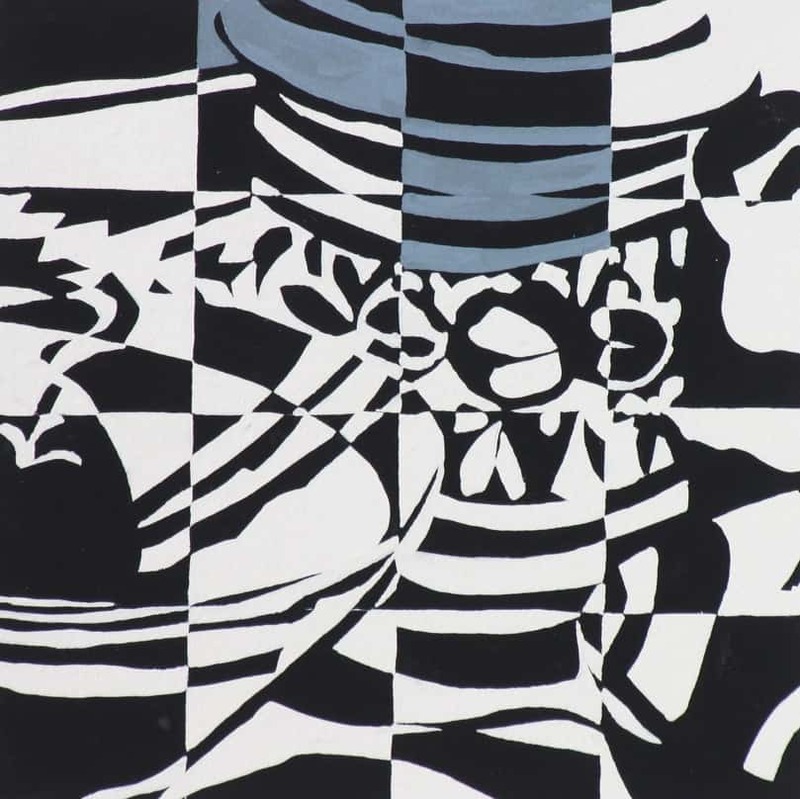 While the grid and optical illusions are present in Livingston’s paintings, the relatively smaller individual forms create more of an all-over pattern. As such, the effect is more calming, allowing the viewer to gradually embrace the whole picture before following the play of color and value within. Livingston’s work has been compared to Minimalist artists, often to Agnes Martin. Martin’s gridded all-over compositions are an apt comparison but differences abound. Martin’s minimal works maintain a solidity of form, a concreteness that places their structural integrity as base for understanding them. Minimalism provided viewers with a direct and non-illusory view of sequences of forms that reflect the mathematical models that underlie nature. Within that model comes an understanding, for Martin and for Livingston, of an unwavering balance that suggests a universal systemic structure. And, perhaps within this, a sense of reassurance that, beyond the paper’s edge, this system will continue in the place of cosmic anarchy. 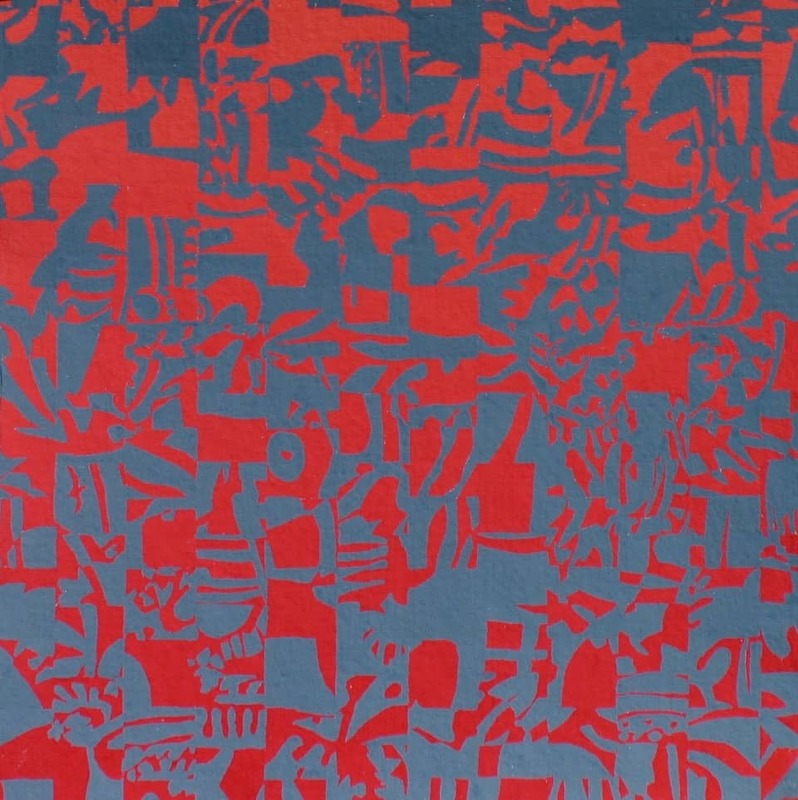 Livingston differs from Martin in her willingness to overlay the structured grid with color changes that create the illusions of dynamic movement through the grid in any number of directions. One’s eye moves across the grid following this subtle shift in directions that seem somehow random. One cannot predict in Livingston’s paintings why a color shift occurs, and why a particular area appears different from another area, when all the mathematics of the drawing remains identical. A balance of structure, form, and absoluteness, weighed against the unknown and nebulous forms the heart of the viewer’s experience. Another apt comparison to Livingston “Fragments” series might be that of James Terrell’s light installations. For years Terrell has created architectural structures with openings to the sky. With sharp edges, these rectangular or square openings flatten the depth of the sky against the structure itself. The resultant relationship between sky and structure becomes dynamic in recent works such as Twilight Epiphany at Houston’s Rice University. The color of the sky changes at sunrise and sunset is matched against the projected color on the underside of the ceiling structure. Here, like Livingston, color simultaneity creates an opportunity for viewers to wonder at these phenomena. The temptation is that there is more to the experience than meets the eye; and, despite mathematics and our best efforts to rationalize our perceptions, we remain confounded at what stands before us. Livingston’s paintings are joyful in this way, allowing the viewer to first feel comfortable in approaching the compositions and then following a seemingly magical path of unknown shifts in one or several layers of color. They celebrate, equally, that part of humanity that is the scientist attempting to understand and ground perceptual experience, and the matrix of human sensation that approaches the emotional, spiritual, or perhaps simply the unexplainable. Each hand-painted form creating a perfect geometric shape is a microcosm of this balance suggesting the breadth of human experience.